There’s very little in Alizee’s pedigree that suggests she’ll run 2000m but Godolphin trainer James Cummings is rolling the dice at Rosehill on Saturday. The Flight Stakes winner from the spring has found the going a bit tougher in the autumn with two unplaced runs at Group 1 level since her first-up win in the Light Fingers Stakes (1200m) in February though the sectionals from Punters Intel say she’s hitting the line with gusto. 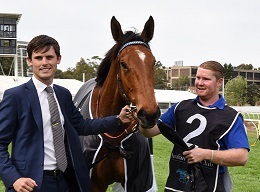 Trainer James Cummings with Alizee after winning the Flight Stakes in the spring. (Pic: Steve Hart). So the Group 1 $500,000 Vinery Stud Stakes (2000m) serves as a crossroad for Alizee, who has the services of Golden Slipper winning hoop Brenton Avdulla. “We’re giving Alizee the opportunity to run over the 2000m in the Vinery Stud Stakes,” Cummings said. A look through Alizee’s background shows plenty of speed influences. Her dam Essaouira only had two starts for a 1000m win, grand-dam Alizes (by noted speed influence Rory’s Jester) didn’t race beyond 1200m, 3rd dam La Baraka was a Group 1 winner at 1100m and wasn’t tried beyond 1400m. You have to go back to Alizee’s fourth dam Triscay who was a champion filly and dual Oaks winner in 1991 for any significant stamina on the dam’s side. On the sire side Sepoy’s second dam is Canny Miss who produced 1999 Queenland Derby winner Camarena. But Sepoy himself didn’t race beyond 1200m. Alizee’s siblings to race include Astern, Group 1 Golden Rose winner at 1400m, Mogador (won to 1100m) and Marrakesh (won to 1100m, placed to 1300m). So you could argue that Alizee, as a Group 1 winner over 1600m, has defied her pedigree already. Cummings is pinning his hopes on Alizee’s brilliant turn of foot to offset the distance query. Punters Intel data showed the filly ran the fastest last 600m of 34.29 to be beaten 2.3 lengths in the Group 1 Coolmore Classic (1500m) two weeks ago despite running 13th behind Daysee Doom. Prior to that she was less than two lengths behind Shoals in the Surround Stakes (1400m), running the third fastest last 600m of 35.18. “There’s no doubt that she’s got a lot of power and she’s a filly with a brilliant turn of foot,’’ he said. Alizee is $6 equal second TAB favourite for the Vinery, alongside Wakeful Stakes (2000m) winner Aloisia, behind Unforgotten ($4.40), another filly unproven at the distance. What do you make of Alizee's run in the Coolmore Classic at Rosehill on March 17? Osorno (R1, $11): “He should be perfectly primed for the 1400m. He might have been a fraction underdone going into his last run given the big jump in distance and the wide run he had. Tally (R2, $11): “He’s much better off here than in a handicap last start and I thought he warmed to the task nicely when he made the jump from 1400m to 2000m. Spectroscope (R8, 13): “He won this race last year. He’s been gelded since then and he returned with a solid first up run at Newcastle where we were putting pressure on the horse to show us more than he had in recent runs.